Posted on January 17, 2012 by Malinda B. Activists gathered at the Arizona Capitol to send the message to state legislators: Women Are Watching. The sky was blue and the T-shirts were pink on January 9, the opening day of the 2012 Arizona State Legislature in Phoenix. More than 350 pro-choice women and men gathered in the rose garden between the House and Senate buildings to make sure Arizona legislators got the message that “Women Are Watching” and we will all be keeping track of the legislation they are putting forward, which will affect women’s access to abortion, health care, and birth control. The legislators couldn’t get to their offices without walking through our exuberant group and being made aware that pro-choice supporters were putting them on notice. I joined the contingency of supporters who “got on the bus” in Tucson and rode up I-10 to lend our voices and presence to those gathering at the Arizona Capitol. When we arrived and made our way through the crowd to the check-in table, I was happy to see how many people had showed up. What made me feel so hopeful was the wide representation of people: women and men, boomers and seniors, college students, and people from across the spectrum of races and cultures. Pro-choice voters from Planned Parenthood Arizona, Arizona List (thank you for the bus ride! 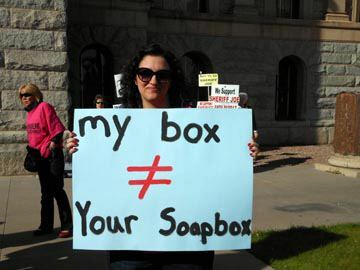 ), NARAL Pro-Choice Arizona, National Organization for Women, Arizona Women’s Political Caucus, the National Council of Jewish Women, and Business and Professional Women of Arizona all joined their considerable forces. On the check-in table there were buttons, stickers, brochures, and important information sheets that listed the names, legislative districts, and office phone numbers of legislators who need to be contacted by phone or email and told that we will hold them accountable for legislation that wages war on women. As check-in was completed, we headed to the open area between the House and Senate. Some of us held signs, some wore buttons, and nearly all of us wore bright pink T-shirts that proclaimed “Women Are Watching” on the front and “Stop the War on Women” on the back. We walked, we talked, we networked, and we shared stories about legislators and information about the anti-choice, anti-woman legislation that had been passed last year. Sometimes we walked the perimeter of the space, sometimes we chanted. “Stop the war on women,” “Our bodies, our choice,” “Women are watching,” and “We vote” rose loud and clear in the morning air. A small group of anti-choice people carried signs and walked silently through our much larger group two or three times. Several uniformed and very serious Capitol police stood watch, but I didn’t hear any angry exchanges between our groups. As Courtney, our coordinator from Arizona List, reminded us on the bus, they are not going to change our minds and we’re not going to change theirs, so there is no point in engaging them. This has also been the policy and training for Planned Parenthood, and I believe both sides realized that no one had anything to gain through heated confrontations. A few local reporters and news cameras also circulated through our group and the Arizona Republic ran a brief story in the paper the next day. I believe there was brief mention on Phoenix television as well, but I didn’t see any coverage in Tucson. Pro-choice activist Kat Sabine (right) poses with state Sen. Paula Aboud. At noon, the rally ended and about 70 of us met at Oaxaca Grill for lunch and to continue our conversations about our legislators and the state of women’s rights in Arizona. State Sen. Paula Aboud, L.D. 28, a staunch pro-choice supporter, joined us and told us how inspired she was by all the people who were willing to stand up for what they believe in. She introduced us to former state Rep. Theresa Ulmer, L.D. 24, and to Jo Holt, Pat Fleming, and Andrea Dalessandro, who will be running for office in the 2012 election. Aboud mentioned how much she appreciated the young people who came to the rally and asked them to encourage other young people to become politically active. She also asked us all to step up and take leadership roles in the movement to protect women’s rights. 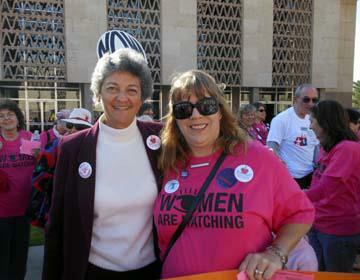 Photos from the rally have been collected on Planned Parenthood Arizona’s Facebook page. This entry was posted in Activism and tagged Arizona, Arizona Capitol, Arizona State Legislature, Paula Aboud, Phoenix, protest, rally by Malinda B.. Bookmark the permalink.